Fork/Join framework uses work-stealing algorithm. Work stealing is a scheduling strategy where worker threads that have finished their own tasks can steal pending tasks from other threads. In parallel execution, tasks are divided among multiple processors/cores. When a core has no work, it should be assigned a task from another processor's overloaded queue rather than being idle. In fork/join thread pool, each task monitors whether it has to work for a long time. If yes it forks it's own task. 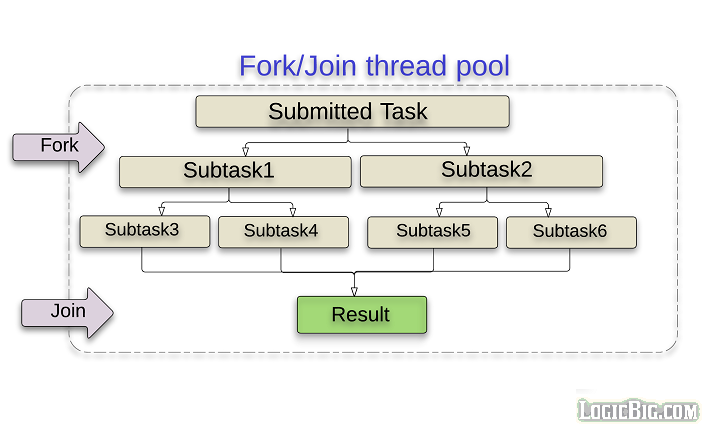 'Fork' is splitting/decomposing of a task and pushing the half (ideally) of it to the parent pool so that other threads can take up (steal) that split task. The term 'join' is combining of results of the tasks submitted to the pool. Tasks are recursively split into smaller parts, run in parallel and recombined. ForkJoinPool class implements ExecutorService. The task submitted to this pool should be subclass of ForkJoinTask. Since this class is not extending ThreadPoolExecutor, it does not have all those core pool size, queuing, maximum pool size concepts, instead it implements work-stealing algorithm. The pool instance returned by above method is initialized in a static block with default settings. That makes sense because a global pool will be aware what cores are being used through out the application at a given point. * parallelism: the parallelism level. * factory: the factory for creating new threads. * asyncMode: If true event-style asynchronous tasks are used. *                 By default it's false which is good for normal commutations. invoke(ForkJoinTask): this calls waits for task to finish. ForkJoinTask#fork() method submits this task to the pool to run it asynchronously. We call this method on the new task instance which we want to split from a main task. We will see shortly in an example how to do that. ForkJoinTask#join() method blocks and returns the result of the computation when it is done. RecursiveAction: This task do not return any recursive result. We have to override it's only one abstract method. compute() method implementation performs the application specific computational task..
RecursiveTask<V>: The subclass returns a computed value. CountedCompleter<V>: This class has been introduced in Java 8. This class can keep track of pending tasks , we have to call setPendingCount or addToPendingCount for each new task that is forked within 'this' task. On completion each task's onCompletion gets called (we have to override this method in our task class). We also have to call tryComplete() or propagateCompletion() when our task finishes so that the pending count can internally decrease and things can work as expected. 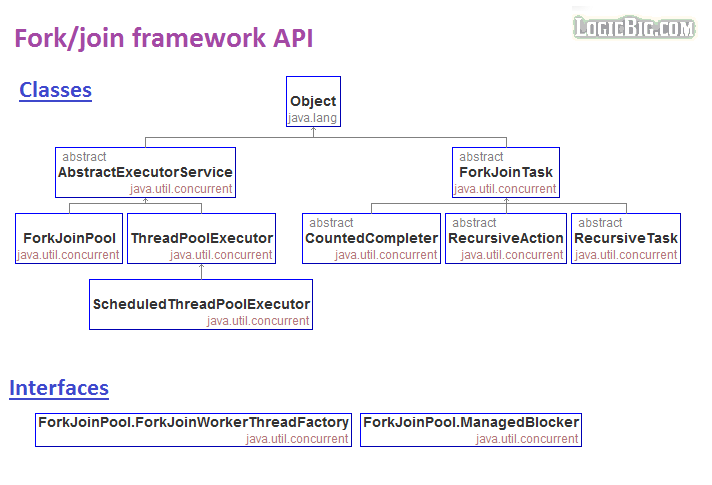 CountedCompleter also has concept of tree arrangement of tasks where each new spawn task (forked) has 'this' parent. We can access the parent by calling CountedCompleter#getCompleter(). CountedCompleter may optionally return a result by overriding getRawResult. The value is returned from join() or invoke() on the caller side. If we don't want to return values then extend it as CountedCompleter<Void>. Here's how everything works : we call addToPendingCount() for every fork(). In the compute(), when done, we call tryComplete(). When the count is zero, the method onCompletion() is called. When the main parent task's pending count becomes zero the main invoke call returns. This class has more control over the task completion than the other two but can be error prone if not used properly. In above example we can pass an instance of Spliterator instead of list. That will make our example list more abstract and also we could use Spliterator#trySplit() for splitting instead of doing that ourselves. An example is included in the code project at the bottom. Submitting the initial task is same as last example.